Combining a little style and beauty today, I recently posted a What’s In My Bag video on my YouTube channel and featured my new Radley London Bow Lane tote that I LOVE. If you’re a fan of Kate Spade or Ralph Lauren style, more structured bags, I think you’re going to love this brand. Plus, if you’re curious what I carry around with me on a daily basis (because we’re all a little nosey, amirite? ), then set aside some time today and check out what’s in my bag! I used to love watching What’s In My Bags years ago on YouTube because you got an inside peek at what your favorite YouTubers carried around. Oftentimes, I’d find a new product or storage solution by watching these videos. Plus, they’re just fun videos to watch while you’re doing chores around the house or cooking dinner. 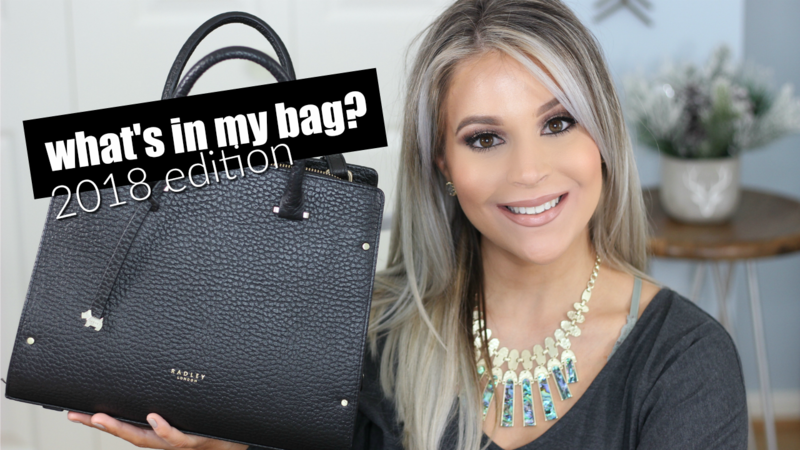 The Radley London bag I featured in this video can be purchased at RadleyLondon.com, or on Macy’s. If you haven’t already, don’t forget to subscribe to my channel for new weekly videos. Next week, I’m doing a review/demo/wear test of the new Rimmel Longwearing Foundation and I’m so excited (we all know how much I love foundation…. ).